I’m writing this post at an odd hour just so I don’t forget to mention every little emotion that’s going through my body and mind right now. In case you haven’t heard yet, WE GOT ENGAGED! To say we’re more in love and happy than ever before truly is an understatement. You will probably see me say a lot of cliches in many posts now, but heck, this is life!!! Whatever people tell you about what you might feel in these big moments – it’s all true. I still can’t believe we’re engaged! Now, I don’t know about you but I LOVE reading any and every proposal story from the people I follow, so I decided to share mine as well. I’m also just SO incredibly happy right now that I don’t want to forget any details of this beautiful chapter. I know that years down the road when we’re married, we will love to come back to this post to relive the moment. We’re boarding a plane to Phoenix! I’ve been telling Rapha for years how much I wanted to visit Arizona and all the parks there, so he decided to surprise me with a bday trip this year! At that point, I knew nothing about our itinerary but the fact we’re going to be there for 4 days. He finally showed me our plans later that day. Being an amazing boyfriend (and listener) that he is, our plans included everything I always wanted to do in Arizona. The only thing that stood out to me on the itinerary was watching the sunset at Grand Canyon. Sounds romantic, right? Is he planning another surprise there? Friday was filled with adventures. We got up early to catch a bus in Flagstaff for our guided tour. 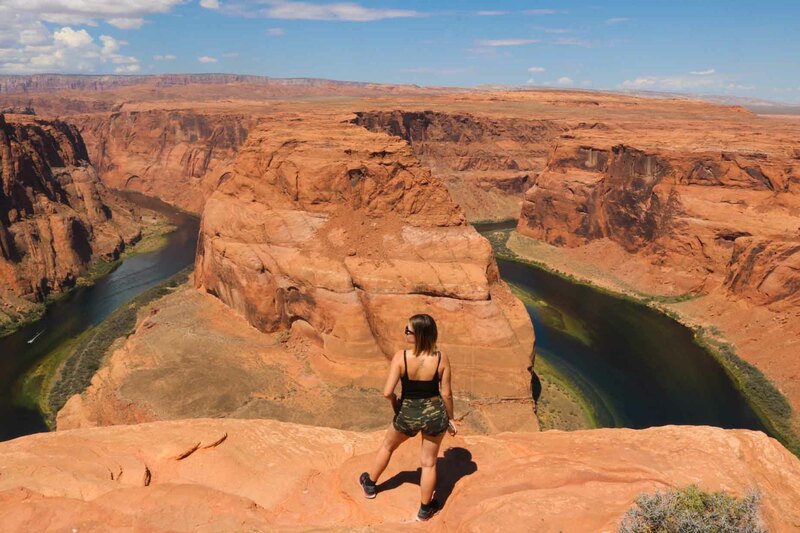 We were heading to Page to see Horseshoe Bend and Antelope Canyon – the place that’s been on my bucket list for years. I was SO excited not only to be able to see those places but also for the fact I’m with a partner who truly goes out of his way to make my dreams come true. I know, I know. Sounds cheesy but it’s nothing but the truth. After we arrived at our first stop, the hike to Horseshoe Bend has commenced. It was about 95 degrees, lots of sun and people around. The views were just incredible!!! It was also the first time the fear of heights started creeping in. I couldn’t help but imagine something bad happening because people were trying to get the shot. Sorry, but I don’t want to fall off the rock just to get a fun photo angle. Anyway, we survived our first attraction viewing without any accidents. Well, we almost fainted from a heat stroke hiking back in the sun but that’s another story. An hour later we were off to our final destination. 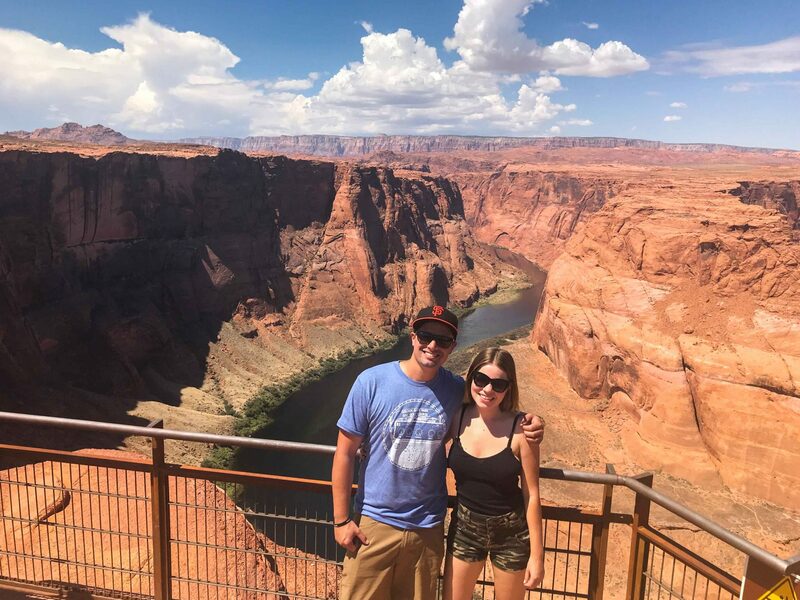 When we finally ascended to the canyon with our tour friends and the Navajo guide, we couldn’t help but take photos left and right. Our guide was actually so generous with helping us get the right shot too. He knew all the best angles! I didn’t know how much space we’re going to have down there and how many people are going to be in my shots, so I was taking photos at every opportunity I could get. Less than 5 minutes in, I was lining up to get a photo with Rapha. Since there were people everywhere, I just wanted to get something right away. Anything worked for me but for some reason it didn’t sit cool with Rapha. I could see him getting anxious trying to find an emptier spot for a photo together. Once again, talking about a perfect guy trying to make my bucket list photo dreams come true. After a bit of scrambling we finally stood together for a photo that our Navajo guide, Ro, was taking for us. Quick snaps on my phone and I’m ready to move on and make space for others. But not Rapha. He asks for one more. I grab my phone from Ro and then look at Rapha thinking he’s taking out his phone for more photos. I couldn’t be more wrong. He was holding a little box and yes, you guessed it – he dropped on his knee. This is when you try to imagine him asking me to marry him, both of us tearing up, me repeatedly screaming “oh my God”, shaking legs and hands and people cheering up with congratulations. Like I said before, it was the most beautiful, surprising and SURREAL moment of my entire life. I always wondered how I would feel on this day and now I finally know. I think my body reaction was a true indicate that in an instant – I was made the happiest girl in the world. Of course I said YES!!! It’s hard to find the right person to spend the rest of your life with, but once you do there’s no better feeling in the world. When you know, you know. I knew I’d take the leap after Paulina and I had a couple’s photo shoot. I’ve never seen her look more beautiful, and every time I looked at her I’d get teary-eyed. 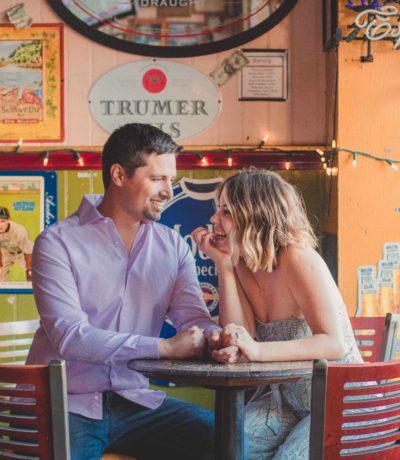 I kept thinking how lucky I was that she found me at the dive bar in my home town. My family has always adored her, and not too long after we had officially started dating did my mother offer me her ring in case she was the one. I told my mom to keep the ring at her house so Paulina wouldn’t find it. Knowing her, she’d have found it while cleaning our room. I knew that if I were to propose to her I’d want it to be a complete surprise. She had been talking for years about wanting to go on a nature vacation to either Utah or Arizona. I chose Arizona because Antelope Canyon has always been both of our bucket lists. Plus, Arizona has some amazing micro breweries that I wanted to check out (no beer in Utah!). 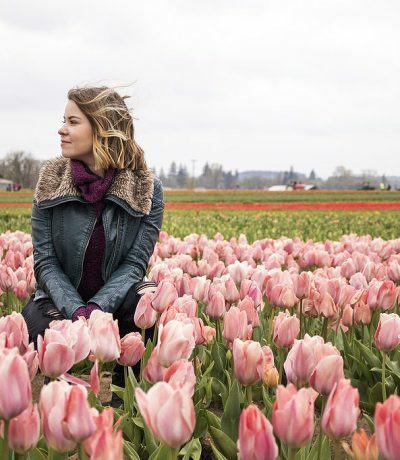 It was difficult planning the whole trip out – I literally mapped out every hour so we’d be super busy and she’d be totally caught off guard when the moment came. Mission accomplished. We got on the bus Friday morning to take a tour of Horseshoe Bend and Antelope Canyon. I had the ring in my backpack and was guarding it like Gollum (nerd alert). Paulina tried putting some stuff in the backpack and I snatched it away from her, saying “I’ll do it, the zipper is tricky”. I was so paranoid that I’d lose the ring that I kept checking the backpack every five minutes – luckily, our tour guide, Brad, was so full of information that Paulina didn’t even notice. Thanks for the distractions, Brad! 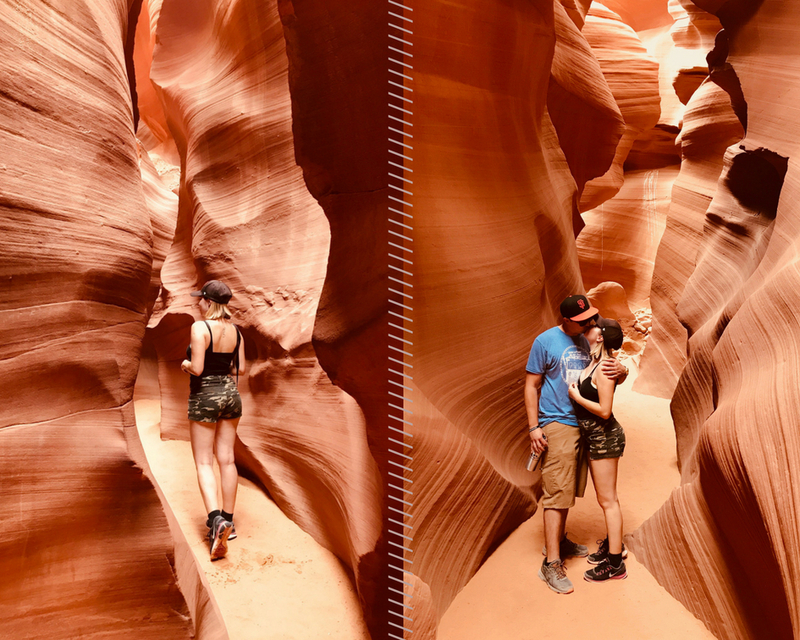 Before we got to Antelope Canyon, Brad said there was a strict no-backpack policy (in order to preserve the integrity of the canyon, they didn’t want anything bumping into the walls). That’s when I freaked out a little bit. You see, I had kept the ring super secret up until that point and had no idea how I was going to dig it out without Paulina noticing. I had a three-second window to furiously rip my bag open and grab the box, shove it in my pocket, and get off the bus with the rest of the group without making too much of a scene. Getting into the canyon wasn’t easy… There are a series of super steep, super thin stairs that lead you down to the first opening. My hands were so sweaty and my legs were shaking so much that I thought I was going to slip and fall on my face. Fate had other plans and I ended up making it down without a hitch. There were a lot of people on the same tour as us, I’d say about 40 total. All 40 of us were kind of on top of each other, all trying to get that first shot of the picturesque wonder. My anxiety was killing me and I couldn’t wait any longer! The first chance we had to take a picture together is when I seized the opportunity to pop the question. Paulina had given our Navajo guide her phone to take a photo of us, and that’s when it happened. I took a deep breath, reached into my pocket, hands shaking, and pulled out the ring box. I looked Paulina in the eyes and held out the ring as I got down on one knee. “Baby, will you marry me?” somehow made it out of my mouth without me fainting. “Oh my god… oh my god…” is all I heard at first. Finally, she said yes! I jumped up, grabbed her in my arms and laid a huge kiss on my now fiancée. A huge weight was lifted at that moment, and I can honestly say it was the happiest moment of my life. I almost forgot we were with a big group until the crowd went wild! 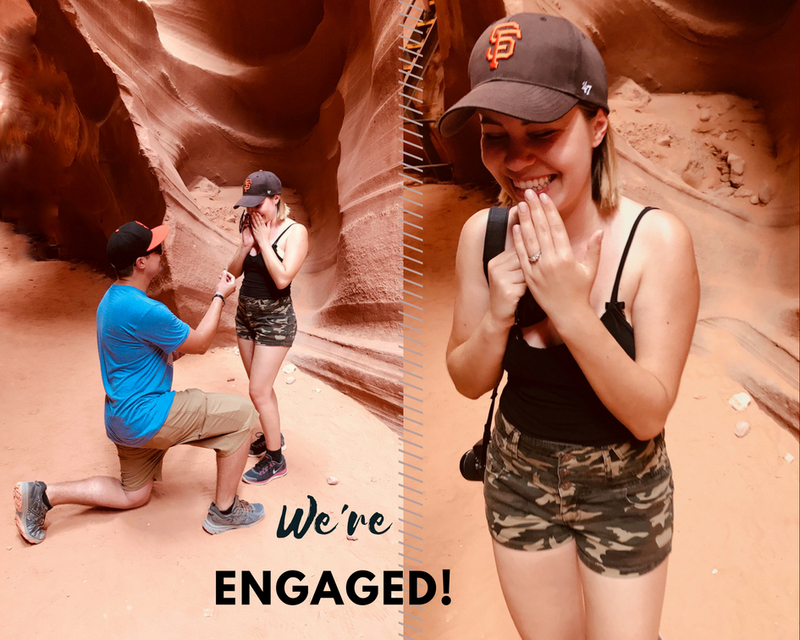 I went into the canyon with a girlfriend and came out with a fiancée. Here’s a little video from that special moment. 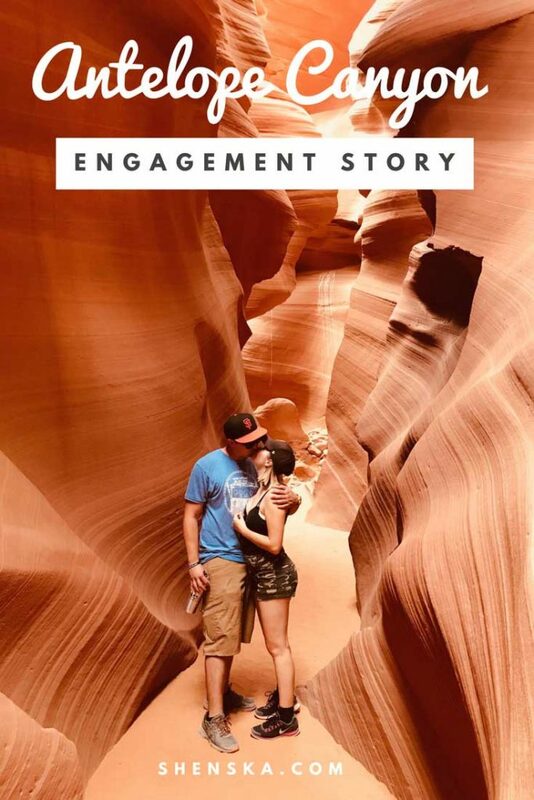 Thank you for reading our proposal story! For us, Antelope Canyon will forever be a place where dreams do come true. 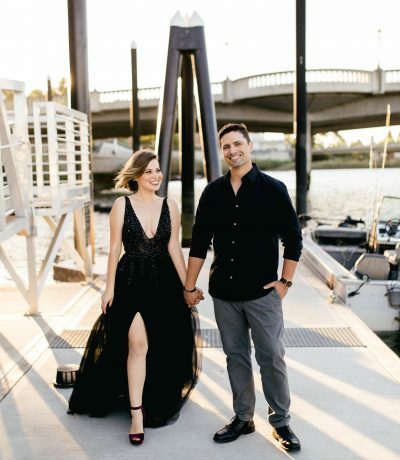 (To save this proposal story into your Pinterest board, hover over any photo and click on the Pin It button in the right top corner. AW thanks, Vanessa! It’s been nothing but love over here and I’m so happy I get to share our story with so many people who care about us. <3 sending love!! Oh my! This is amazing! Congrats dear. 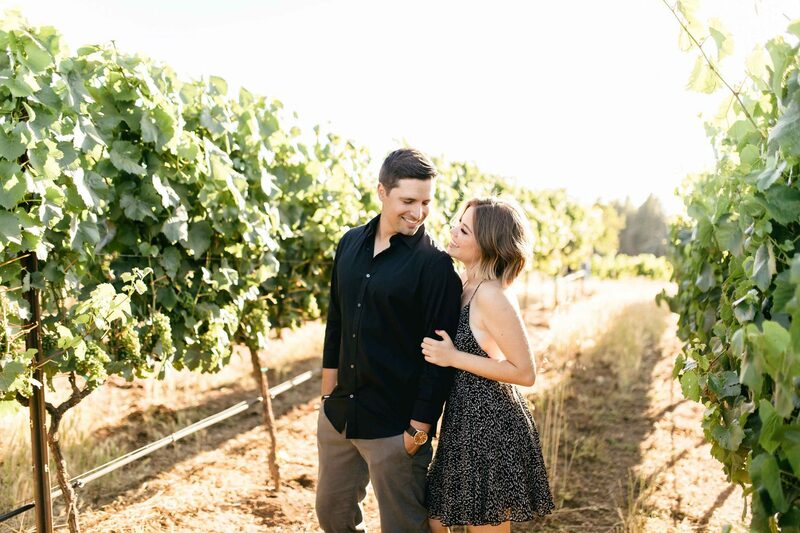 You have the loveliest engagement photos! Thank you so much for the love, Jessica! Congratulations! What a beautiful story! I cannot wait to hear more about the wedding planning too.